planetf1.com :: View topic - Verstappen the new crash kid? I was about to start a thread entitled Is Verstappen the new Pastor Maldonaldo? I think you covered all bases. Verstappen comes across as a driver who hasn't yet been convinced that there is anything wrong with his approach. This is a surprise because I would have thought there were plenty of people around him to advise him to change something. It has been mentioned before in this thread that Hamilton made a lot of similar mistakes in 2011. I remember various collisions with Massa, a smash with Button in Canada and a collision with a Sauber at Spa. I seem to remember he blamed it on not being able to see his mirrors properly and denied it was distractions from outside of F1. Anyway, that season seemed to change Hamilton and he came back more mature in 2012. Maybe Verstappen is just going through a similar process. Why do you feel the need to label a person in a derogatory way? The best of drivers have a bad spell. And its not limited to drivers but everybody. Nobody enjoys being in that situation. I think that's exactly what it is and Verstappen will learn the same lesson that Hamilton learned; it doesn't matter who's fault it is, what matters is that you are out of the race and behind in the points. That's what hasn't kicked in for Max yet. If he doesn't turn things around, it will make three straight years where he has lost to Daniel in the points. Regardless of how young he is, that isn't something to ignore. No it's been reported that Vettel's car was damaged. Do you think that Austria 2016 was Hamilton's fault then? To blame Monza 2017 on Verstappen is complete nonsense. Max was alongside Massa and had more than earned the space on the next corner. Massa just took the chicane like Max wasn't even there. Max was equally blameless for the collisions at the start in Spain and Singapore. On both occasions, it clearly wasn't his fault. Hungary was the only significant mistake Max made in all of 2017. Just like Max, you're missing the whole point by focusing on whether he was 'to blame' for his incidents. Doesn't matter. If you put the car in a position where the other driver is expected to hit you, it doesn't matter if it's their 'fault' - you've thrown the race away. In modern F1, drivers run each other off the track if they're on the racing line and their opponent is outside. They all do it, and they all know they do it. Putting yourself in a position to be hit when the other car takes the corner normally is just poor race craft. This has to be one of the most hilarious things I have ever read on this forum. EVERY SINGLE time a driver has overtaken another around the outside, he put his car in a position to be hit if the other car takes the corner normally. It’s up to the other car to notice that there’s a driver around his outside and take the corner accordingly. If he'd tried it on a lot of poorer drivers, he'd probably have got hit. But that's not what I'm talking about: Alonso was actually ahead when he turned in. Watch overtake number 3 of this video. Hamilton did the exact same overtake on Massa in 2014, Massa actually left him space. Was that poor racecraft? After all, he left himself exposed to a possible collision if Massa took the chicane normally. Verstappen has really became the scapegoat of F1 recently. The things people will now blame him for are hilarious. Unless you pass someone on a straight it's impossible not to put yourself in a position where you rely on the car you are overtaking to alter their normal line. Are you saying that both Ricciardo's passes in China were poor race craft? What about Alonso's famous move on Schumacher around 130r? According to your definition most passes we see are "poor race craft". Also worth mentioning that he has already changed his approach. He doesn't move around in the braking zone anymore and he doesn't move to block drivers on the straight after they have already made their move anymore. Of drivers still do this of course but when it isn't Verstappen no fairy cakes are given. I think I saw a few comments critical of Bottas moving under braking when being overtaken by Ricciardo. Verstappen was (rightly so, I believe) getting flak last year and in 2016 for moves like this, this and this. These were very dangerous. I agree. And people went to town on Verstappen for all of those. Other drivers do it and it barely gets a mention. I can't think of any instances when other drivers have repeatedly and consistently changed their line under braking like Verstappen did previous to this year, which is what upset most people it seemed. If you put the car in a position where the other driver is expected to hit you, it doesn't matter if it's their 'fault' - you've thrown the race away. I think you (and KingVoid) are taking what I said a bit too literally, or perhaps I put it a bit too broadly. Yes, drivers are constantly altering their lines when racing wheel-to-wheel. But in the example we're talking about (Max vs. Massa, Italy) Verstappen had been forced entirely off track by Massa and tried to rejoin the track right into the side of Massa's car. Was it fair for Massa to force him off? Probably not, but they all do it. Was it reasonable of Max to then try to drive back into him instead of conceding the position? No, it was always going to end in a collision. To rephrase what I said - putting yourself in a position to be hit if the other car does not take evasive action is just poor race craft. And I stick by that one: many famous overtaking moves (such as the majority of Senna's, in my opinion) do fall afoul of that definition, but I don't consider them to be good racecraft either. Fundamentally, by the time the crash with Massa happened it wasn't a case of Massa turning into Max anymore, it was a case of Max just driving into the side of Massa. To use a similar example from the last GP: Alonso on Vettel at turn 1/2. Basically the same move: Alonso ran Vettel off track, which was a dirty overtake in and of itself. But Vettel didn't just keep going and drive into the side of Alonso's car after the position was clearly lost, which is what Max did in Italy. There's KMag, and I'm pretty sure people do indeed criticize him for it. Vettel also chops other drivers off the start (similar idea to moving under braking), and again he gets criticized for it. Hamilton and Rosberg used to run each other off track at the first corner, and they got criticized for it. Verstappen's racing in 2016 was dangerous and dirty, and he rightly got criticized for it. He stopped it, and people rightly stopped criticizing him for it. Now he's made some boneheaded decisions, and people are criticizing him again. It's really not a double standard. If you look at Massa vs Hamilton in Monza 2014 and Massa vs Verstappen in Monza 2017, you can see that Massa did not treat Hamilton the same as he treated Max. It is obvious that because of Max's reputation, a veteran driver like Massa was not going to make it easy for him. Massa has a lot more respect for Hamilton than he does for Max is what I could deduce from watching those two videos. I have blamed Max for the Monza incident in the past but I must change my tune after watching the Massa vs Hamilton clip. It was Massa's fault vs Max, because he didn't leave any room even though Max's car was completely alongside. So why would the driver at fault get away with it if the driver who suffered had no blame? I believe they left it as it was with no action as verstappen was at fault and suffered because of an overoptimistic overtake. As Massa didn't get punished, he must have had the right to do what he did even if it was harsh. That's true, Massa gave Hamilton a lot more room. But that's completely beside the point I'm making, which I'm getting somewhat tired of having to repeat. It doesn't matter if Massa was to blame for forcing Verstappen off track. Verstappen had already been pushed off track, and tried to rejoin straight into the side of Massa's car. Why is Max still turning hard right at this moment? What exactly does he think is going to happen next, except for a crunch into Massa's sidepod? Yes, the move was probably unfair, but that doesn't matter. It was time to avoid the collision, and that's what he didn't do. By repeatedly and consistently, you mean twice? And by previous to this year you mean previous to 2017 surely ? Max hasn't done it in a long time. My memory failed me with specifics, I have to admit, though I thought it happened at least a handful of times since he joined Red Bull in 2016 (perhaps several times in successive races during that period). If I'm wrong and it only happened twice I'll happily be proven correct. Austria were Rosberg decided not to turn for the corner and drive Hamilton straight off the track but Hamilton who by the way was the car in front, decided he was staying on the track, Rosberg was penalised. Then on to Australia were Verstappen's onboard shows him repeatedly turning his steering wheel to the left despite the track going to the right, the movements were to force Hamilton off the track but yet again Hamilton chose to stay on the track. Monza 2017 Verstappen tried to force a square shaped object into a round shaped hole, it was impetuous just like his collision with Vettel in China. I wouldn't be blaming Verstappen for initiating the two 3 car collisions but in Spain I certainly would use it as an example of the level of risk he takes at the start of races. He also hit cars at the start of the Canadian and Mexican races, rear wheel onto front wing but of course such things only get labelled as mistakes when you end up with rear wheel punctures. He certainly gave a different kind of interview after China, full of humility rather then him against the world approach and always backed up 100% by the likes of Horner, there certainly seems to be a change of attitude with Max, Horner and even Jos in saying that his approach needs to change, all for the better in my opinion, a great driver doesn't need to drive like a Maldonado. Indeed and although not excusable Bottas was defending the lead of the race, it was only last week that some were saying that Bottas should have dive bombed Vettel regardless of the consequences and all because it was for the lead of the race, now if Bottas was doing that all the time? Indeed Verstappen is clearly looking to push Massa off the track at the exit of the chicane, perhaps getting his own back, but instead smashed his car up and that is Massa's fault, were do you think Massa was going to go apart from completely off the track to avoid contact? Massa has clearly not given enough room? Do you blame Hamilton for his crash with Maldanado in Valencia 2012? It's very similar. I’m completely fine with no penalty in this case but I feel Massa was the initiator in the incident. It didn’t warrant a penalty in my book but he was the more guilty party. To me it depends how much car Verstappen had alongside. If it had been less than half a car length he would have been guilty 100 percent and should have been penalized. He decided that he was not going to give in. He kept his elbows out so to speak. Nothing wrong with that. It’s just hard racing but the bad race craft was from Massa. Maldonado was in the Verstappen position and Maldonado got penalised, I do find the comparison between the two quite apt. Kind of proves my point. It's been blown out of proportion so much you thought it was something that had happened consistently through 2016 and 2017. Really we are only looking at twice. Ok, that's twice to many but doesn't put him out of line with most drivers. So you're saying he hit Massa on purpose to make a point? I wouldn't argue with that, but I don't think it's responsible or a good idea. Well I don't think he hit Massa on purpose. He is entitled to room because his car is alongside. Did Hamilton hit Rosberg on purpose in Austria 16'? Or did Hamilton hit Verstappen on purpose in Bahrain? He could have easily avoided it. But Rosberg was behind in Spa '14, right? 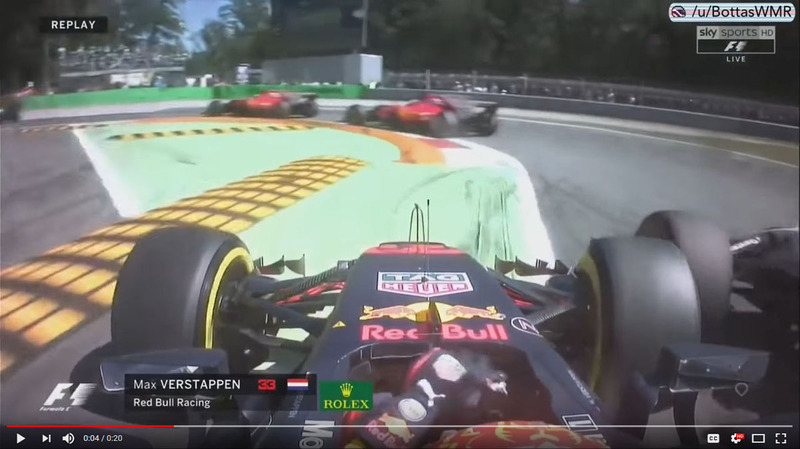 In Monza, Verstappen was still fully alongside when Massa decided to just push Verstappen out. He had no right to.